peace through deterrence was like putting two scorpions in a jar: they can't sting without getting stung, but it still doesn't stop them. One of the Children of Peace is Greta Gustafsen Stuart, Duchess of Halifax and Crown Princess of the Pan Polar Confederacy. Like the others, she knows that at any moment she could be taken to the grey room to die. Like the others, she has been prepared for this all her life. But she's in more danger than the Children who come from more peaceful nations, and when a new boy named Elian arrives, her death suddenly seems more imminent. Exciting and threatening at the same time! of YA dystopias by now, or that they'd all seem the same, but nope. Bow has managed to create a dystopian world quite different from the others, though bits of it reminded me of The Selection and The Hunger Games. These kids are royalty, but they also could die. Plus, it's a futuristic world that contains new technology like robots, but also basic old-timey agriculture. (I will never again be able to hear the worlds "apple press" without shuddering a bit.) It's a scary world filled with mean people, and also robots, some of whom used to be people. Also, it takes place in Saskatchewan, which I think is kind of cool. The kids are great too! They are a diverse cast of friends including Greta, who is essentially Canadian, her Asian roommate Li Da-Xia, and the new kid Elian, who is from a new state called the Cumberland Alliance which is part of what is currently the U.S. Others are from Africa and Europe, but of course the political geography is all very different than now. Their friendships are both strong and tenuous - any of them could die, but at the same time all they have is each other. I think my one criticism of the story is that I couldn't tell if this group of friends were the only kids at the Precepture or just the ones we focused on. There didn't seem to be any extras in the background, but late in the book it seemed like there were actually more kids there than I thought. I'd be remiss if I didn't mention the Abbott, the robot who was basically headmaster of the school, or Talis, who is essentially the supreme ruler and whose "Utterances" are quoted as though they're the Bible. In addition to these human-like robots, there are all of these little spider-like robots that follow the kids around and shock them when they behave badly. They are constantly watched by something called the Panopticon also, so basically they are hardly ever alone and have developed ways of speaking in code to each other. It's so incredibly strict. I didn't know that this was going to be first in a series (though I should have guessed it), but the ending doesn't leave you hanging. In fact, I thought it might be a stand-alone until I checked Goodreads for more information. Although the novel left me satisfied, I'm also curious about this world Bow has created. In this book we just saw one Precepture, but I bet the rest of the world is pretty different. There's definitely potential for more story, and I may keep my eye out for the next part. If you like YA dystopias, this is essential reading! 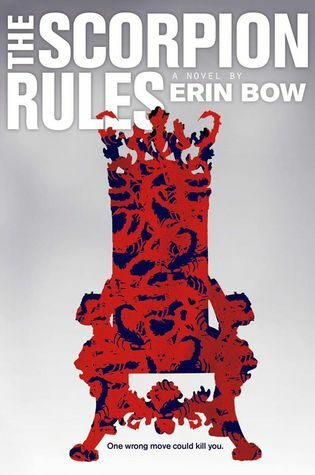 The Scorpion Rules will be available on September 22. I received my copy courtesy of the publisher. I was not compensated for this review.